Ever notice how the best photography happens at nature’s boundaries, the interface separating disparate elements? Sometimes it’s visual elements, like the collision of surf and shore or the intersection of shadow and light. But often we’re moved by images that capture the transition of our experience of the world, such as the color and light that happens when we shift between night and day, or distinctive elements of two seasons together in one frame. Sunrises and sunsets are a daily occurrence, but the opportunity to capture snow and autumn leaves, or snow and spring flowers, comes just once a year. And until last week, with Yosemite’s waterfalls approaching a summer trickle, and the spring dogwood bloom at least a month early, prospects for the elusive snow with dogwood opportunity didn’t look good. Despite Yosemite Valley’s snowless winter, the optimist in me steadfastly monitored an incoming storm, openly defying my internal pessimist that knew the promise of snow would surely fade as the designated day neared. In recent years the pessimist has prevailed in these internal conflicts, thanks to a stream of promising storm after promising storm detoured into the Pacific Northwest by a persistent ridge of high pressure. But for some reason this storm was different, and while the forecast details changed daily, the one constant was that it seemed determined to defy the ridge. Not only that, this new storm originated in the arctic—what it lacked in tropical (drought busting) moisture, it made up for with air cold enough to deposit snow all the way down to Yosemite Valley. So, despite the fact that I’d just returned Saturday night from four days in Yosemite (for my spring photo workshop), I found myself on the road back Tuesday morning. With my (4-wheel-drive) Pilot in the shop for some minor body work, I congratulated myself for having the good sense to rent a Jeep when I scheduled the work, even though at the time snow was the last thing on any Californian’s mind. The queue at the Yosemite entrance station was backed up about a 1/4 mile, and as I idled in a steady rain (the outside temperature was 38F, and with 1500 more feet to climb, I had no doubt it was snowing in Yosemite Valley), it occurred to me that I didn’t actually see anything indicating 4WD anywhere in or on the vehicle. Of course surely a Jeep will have 4WD, but for peace of mind I reached for the manual in the glovebox…. The manual provided no encouraging or discouraging words. As I crept toward the entrance, chain requirement signs seemed to be taunting me, I saw several cars ahead of me turned away for not having chains or 4WD. Approaching the booth, I still wasn’t sure whether I had 4WD (I think I knew, but I was in serious denial), but it dawned on me that without it, my trip was in jeopardy. I rolled to the entrance window and the ranger eyeballed my Jeep—I waved my National Park pass in front of him, and without coming to a complete stop uttered, “These aren’t the droids you’re looking for”, then held my breath as he moved me along. Phew. Of course my problem was more than simply getting into the park—if conditions truly did merit chains, I knew of no Jedi tricks that would spare me. The snow appeared just a couple of miles up the road, but by the time I got there it was no longer falling and the road turned out to be clear all the way up to the valley. The rest of the afternoon I photographed Yosemite Valley sporting a light but nice dusting of snow. Parking the car for dinner at Yosemite Lodge, I crossed my fingers that the predicted overnight snow would hold off until I retreated to my hotel below the snow line. No such luck. Stomach full, I exited the cafeteria to at least an inch of new snow, now falling fast enough that my visibility was severely limited and traction was dubious—beautiful indeed, but extremely stressful for this driver. With no other cars on the road, I split the gap in the trees (all actual signs of a road had been obliterated) all the way down the mountain, poking along at about 10 miles per hour but still occasionally unable to resist flipping on my high-beams to recreate a slow-motion Millennium Falcon shift into hyperspace effect. I made it down the hill without incident, then immediately started stressing about the next morning. If the snow fell this hard all night, Yosemite would surely be spectacular, but lacking chains or 4WD, I’d not be able to get there to enjoy it. I rose at 5:30 and headed back into the park in the dark. Much to my relief, the snow had stopped in the night, and at each “Chains required” sign I rationalized that the warning was left over from the night before and decided to continue until I actually encountered snow and ice on the road. In Yosemite Valley I found every tree and rock fringed with snow, but the roads were fine. Freed to concentrate on photography, I knew I had about two hours of quality shooting before the clouds departed, the light hardened, and snow dropped from the trees. My first stop was a personal favorite spot beside the Merced River, too small for a group, where I hoped to find blooms on the dogwood tree that aligns with El Capitan and the Merced River. I arrived just in time to catch the morning’s first light on El Capitan, the moment made even more dramatic by the diaphanous vestiges of the departing storm. I worked the rapidly changing scene hard, shooting entirely with my 24-70 lens, but using pretty much every millimeter of the lens’s focal range before heading up the hill to Tunnel View. I drove home thankful for enough snow to photograph, but not so much that I couldn’t navigate, and for the rare opportunity to leverage the late snow and early spring into images capturing the best of both seasons. 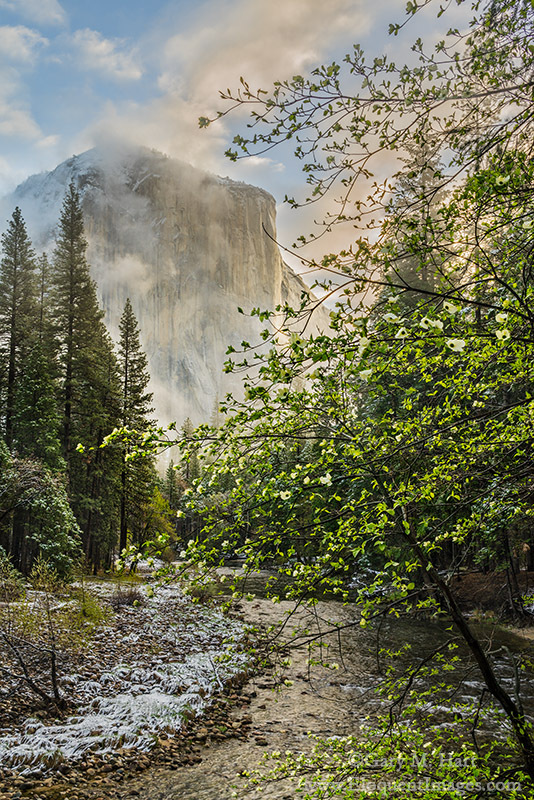 Beautiful gallery of El Capitan images, Gary. Great post. Wish you wouldn’t downplay the importance of chains/4wd so much. Twice I have personally pulled people out who slid off the road on 120 because they weren’t using chains. Photographers are already crazy when it comes to getting “the shot” (trust me, I’m one of them), and the last thing that we need is encouragement to disregard the laws just because of a spring snow in yosemite…or any other weather occurrence for that matter. No photo in a worth your life, or anyone else’s. Born and raised in Northern California, I’m well aware of the importance of chains and at no point on this trip risked myself or others. In this post I took a calculated risk that my readers would grasp the humor and not view my words as an endorsement of chain-free driving. I’m sure you are experienced enough to make the right decision, but most people visiting Yosemite aren’t and I would hate for them to get the wrong idea. Thank you for your concern, Garrett.